Welcome! I'm so happy YOU came for a visit! Please take a look around at all of our fun blog posts and to make sure you don't miss anything subscribe to the RSS feed. Thanks for visiting! 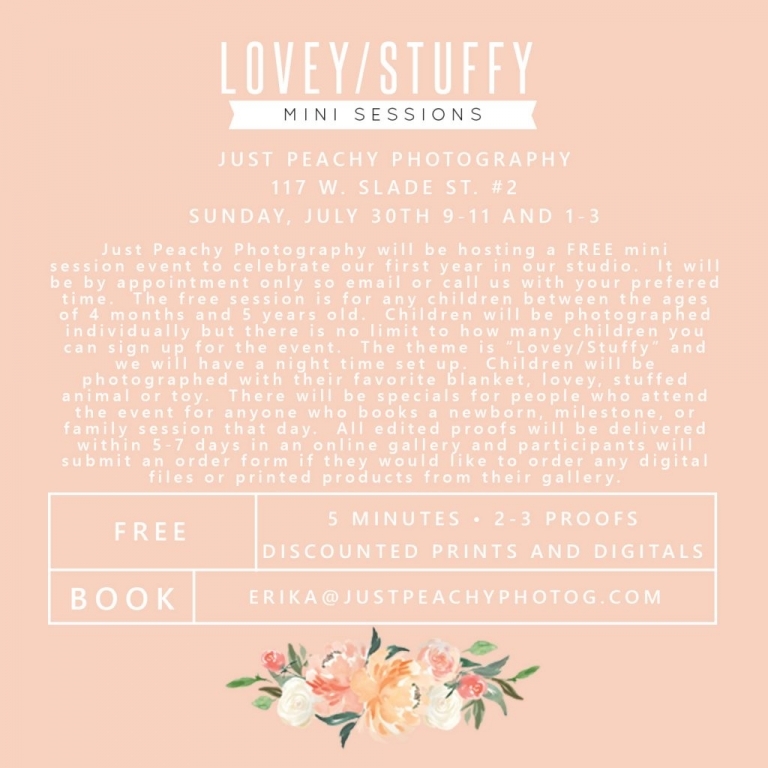 Just Peachy Photography will be hosting a FREE mini session event to celebrate our first year in our studio. It will be by appointment only so email or call us with your prefered time. The free session is for any children between the ages of 4 months and 5 years old. Children will be photographed individually but there is no limit to how many children you can sign up for the event. The theme is “Lovey/Stuffy” and we will have a night time set up — blue sky with stars. Children will be photographed with their favorite blanket, lovey, stuffed animal or toy. There will be specials for people who attend the event for anyone who books a newborn, milestone, or family session that day. All edited proofs will be delivered within 5-7 days in an online gallery and participants will submit an order form if they would like to order any digital files or printed products from their gallery. Digital files will be $25 and includes high resolution image in color and black and white. Also there will be prints available starting at $15, other printed products available, and session discounts too! Contact the studio at Erika@justpeachyphotog.com or 224-801-1680 for details!